As the philanthropic arm of AFP, the AFP Foundation for Philanthropy—Canada supports many programs and services through its highly successful Annual Fund, especially the Every Member Campaign, and other fundraising vehicles including Major Gifts, Planned Gifts and Endowments. 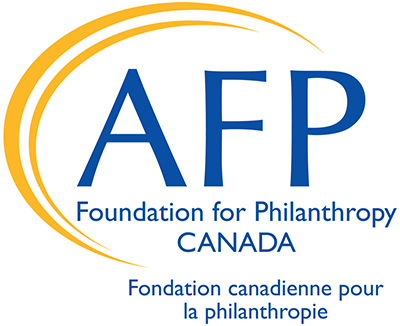 The AFP Foundation for Philanthropy - Canada was created in 1998 to help fulfill the mission of the Association of Fundraising Professionals (AFP), previously the National Society of Fund Raising Professionals: Advancing philanthropy through education, advocacy and training in Canada. Ensure the advancement of philanthropy by supporting AFP's mission and goals in Canada. Seek, receive and expend philanthropic funds on AFP's behalf. Engage in related activities required to fulfill its purposes and mission. The AFP Canadian Foundation secures funds and other resources to implement AFP's short- and long-range plans through its Annual Fund, planned gifts, endowments and major gifts initiative. In addition, the AFP Canadian Foundation assists AFP Canadian chapters with educational programs and Scholarships through its allocations back to the chapter's geographical area. Each year, the AFP Canadian Foundation conducts an Annual Fund campaign - the Every Member Campaign (EMC) - that accepts unrestricted gifts designated for general purposes and major priorities. Donors of deferred gifts totaling $5,000 or more are recognized as Omega Circle members. Gifts can be made through the Canadian Foundation in a number of forms, including bequests, gift annuities and trusts. The Canadian Foundation manages endowment funds that provide resources for various AFP initiatives, including scholarships and mentoring programs. Several funds have been established as a tribute to individuals who have made significant contributions to philanthropy. To learn more about the AFP Foundation for Philanthropy - Canada, call 416-941-9144, or email cdnfoundation@afpglobal.org.